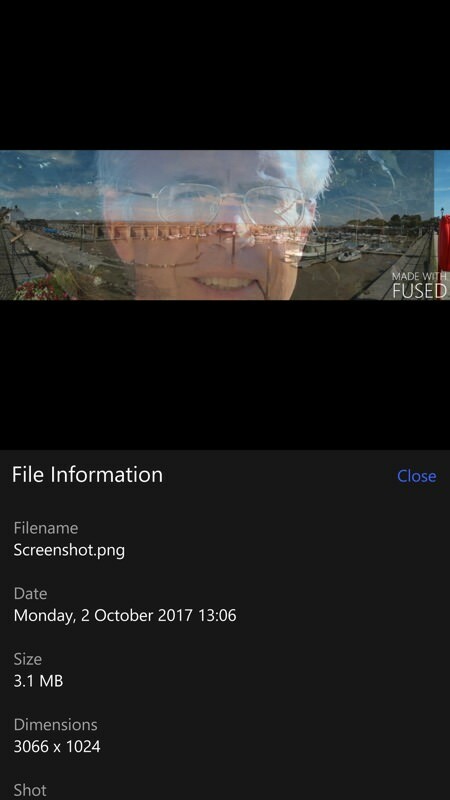 Winning the award for the longest-titled application we've seen yet, Fused UWP (as I'll call it) has one function in life - to combine two photos to create a new work of art. Now, obviously, results will depend massively on the two photos concerned, but the possibilities are interesting, at least... Here's my review. 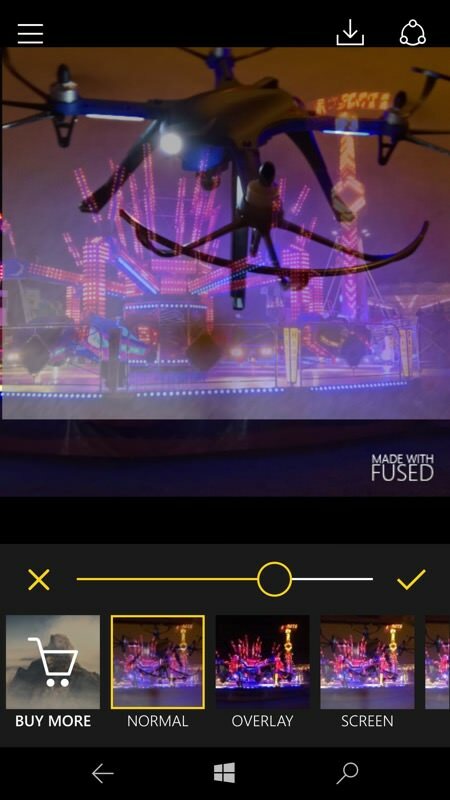 Double exposure made easy…FUSED is the very first app that allows you to blend videos, photos, or a combination of both. We are especially excited to launch Artists Collections for FUSED so you can create beautiful, one-of-a-kind visuals with inspired work from talented emerging artists! Make color adjustments to each layer and apply masking if you like. 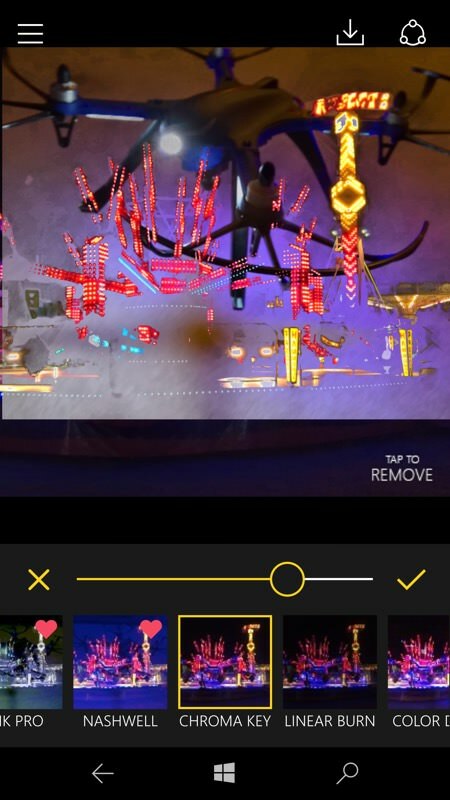 Export your work to share on all your favorite social places or save to your Camera Roll. 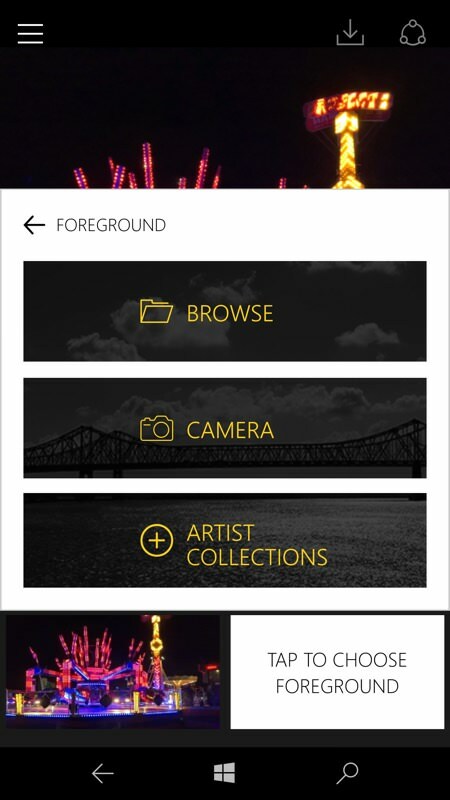 "Artists Collections” featuring videos and images from up and coming artists. 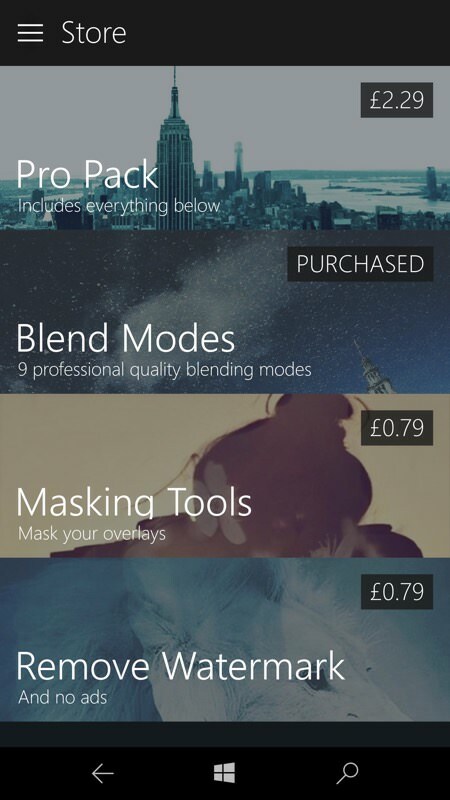 Blend these with your own projects to create some amazing artwork! Experimentation time then - you pick (or take) a background photo, which then appears in the main workspace and also bottom left. Although I had a fairground shot here, artistic-minded people might want to capture a photo of a curtain or wall or something else with 'texture' here? 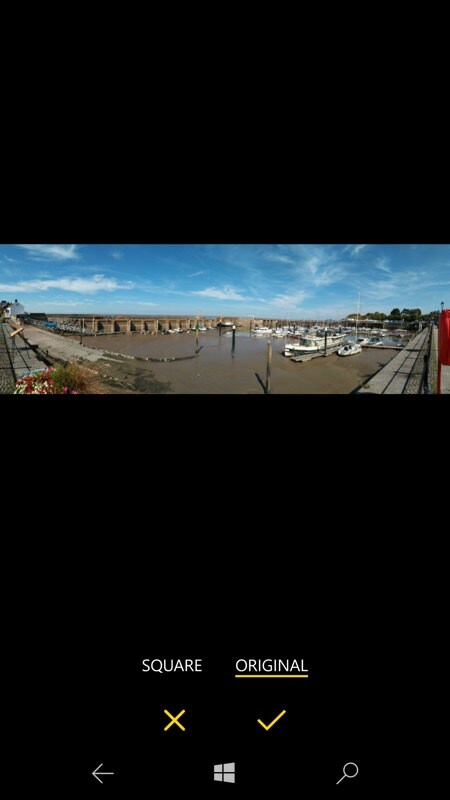 (right) You then pick a 'foreground' photo and it gets overlaid on top - the slider controls the relevant opacity of each image. Here I'm going for 'an alien craft landing on a neon city' vibe. There are lots of image combination methods provided here, each with its own fader. 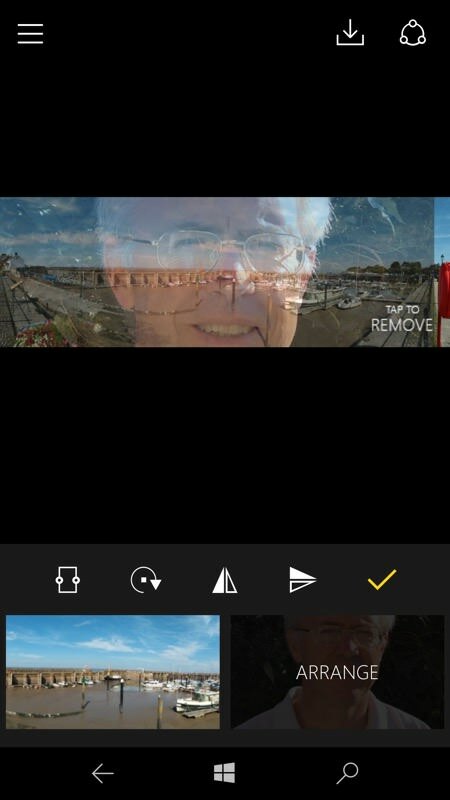 I've paid the 79p for the extra methods in the screen above, left, first applying a 'Chroma key' look and then using the provided brightness adjustor. Pretty spacey, eh? Although by default everything's square, you can also opt to import non-square/original aspect ratios and then the foreground gets cropped on top, as shown above, right. Maybe something suitable for a social media masthead? In terms of resolution for Fused UWP's output, it's 1MP only for square images or more if you opt for original aspect ratios - so in one of my examples with a panoramic shot, I got Fused's output up to 3MP, as shown above, left, but that's as high as it gets. OK for basic social sharing, but no more. But then given the mish mash of pixels involved I guess you'd rarely want any more fidelity? 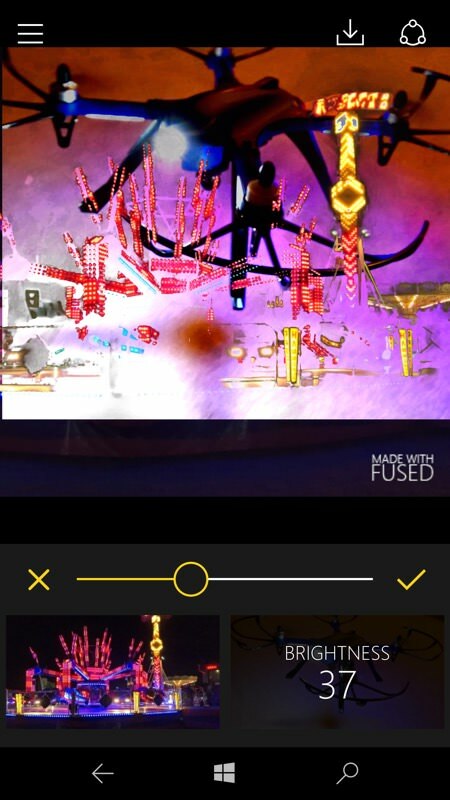 You can grab Fused UWP in the Store here. It's free to download and try out, though all the more arty 'fusing' methods are behind in-app-purchases, though the amounts are trivial. Ditto removing the watermark, so its 79p purchase is the real cost of the basic application here.